In the picture the man is 'foaming at the mouth.' What does this mean? 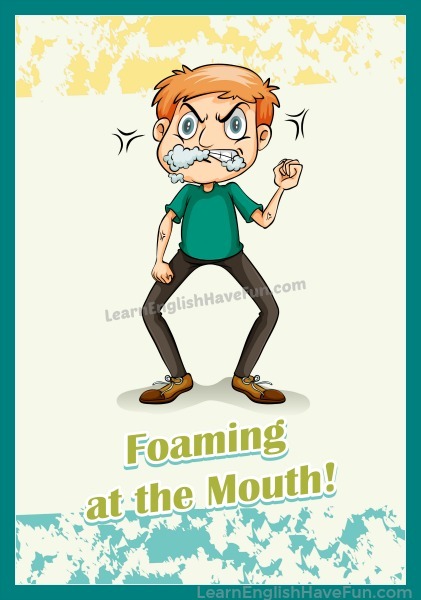 Foam at the mouth: to be extremely angry. This idiomatic expression comes from describing animals and people who have rabies—a viral disease that causes paralysis. This virus attacks the animals throat and jaw muscles until they can no longer swallow. This causes the animals to drool (the saliva drips out of their mouth) and this can be called "foaming" at the mouth. (Foam is a mass of small bubbles in liquid). Since the rabies virus attacks the brain, animals with rabies often behave strangely and aggressively and try to bite people and other animals. It's as if the animals are very angry and this is how the idiom originated. "Can't we have a normal discussion? Screaming and foaming at the mouth about which restaurant to go to is ridiculous!" My mother was foaming at the mouth at our dinner party when my dad told everyone she uses Botox to get rid of her wrinkles. I was foaming at the mouth when my teacher told the class that I'd failed the exam. Our kids were foaming at the mouth when we told them we'd give their Christmas toys away if they didn't stop arguing. My dad foams at the mouth every time his team loses a game but don't worry, he'll calm down by dinner time. My husband was foaming at the mouth when I told him I saw my high school sweetheart at the grocery store. I never go to that spinning class at the gym. The teacher practically foams at the mouth while she yells instructions at us to peddle faster. I was foaming at the mouth while listening to my secretary explain how she lost the iPad I loaned her. My parents will be foaming at the mouth when they see my grades this semester. Have you signed-up for my free newsletter yet? I provide updates on what I add to my website and also provide valuable information and notices about my writing contests. Have you foamed at the mouth recently? Why? Where? What happened. 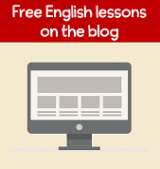 Tell us the details—it's a great way to practice your English and I'll be sure to give you feedback. Simply write a sentence or two in the comments box below.